to a friend Do you like this page? The pansy or pansy violet is a plant cultivated as a garden flower. Pansies are derived from Viola tricolor also called the Heartsease or 'Johnny Jump Up'. However, many garden varieties are hybrids and are referred to as Viola × wittrockiana but sometimes they are listed under the name Viola tricolor hortensis. The name "pansy" also appears as part of the common name of a number of wildflowers belonging, like the cultivated pansy, to the genus Viola. Some unrelated species, such as the Pansy Monkeyflower, also have "pansy" in their name. Pansy breeding has produced a wide range of flower colours including yellow, gold, orange, purple, violet, red and even black (dark purple)many with large showy face markings. A large number of bicoloured flowers have also been produced. They are generally very cold hardy plants surviving freezing even during their blooming period. Plants grow well in sunny or partially sunny positions in well draining soils. Pansies are developed from viola species that are normally biennials with a two-year life cycle. The first year plant produce greenery and then bear flowers and seeds their second year of growth and afterwards die like annuals. Because of selective human breeding, most garden pansies bloom the first year, some in as little as nine weeks after sowing. Most biennials are purchased as packs of young plants from the garden centre and planted directly into the garden soil. Under favourable conditions, pansies and viola can often be grown as perennial plants, but are generally treated as annuals or biennial plants because after a few years of growth the stems become long and scraggly. Plants grow up to nine inches (23 cm) tall, and the flowers are two to three inches (about 6 cm) in diameter, though there are some smaller and larger flowering cultivars available too. The pansy has two top petals overlapping slightly, two side petals, beards where the three lower petals join the center of the flower, and a single bottom petal with a slight indentation. The name pansy is derived from the French word pensée meaning "thought", and was so named because the flower resembles a human face; in August it nods forward as if deep in thought. Because of this the pansy has long been a symbol of Freethought and has been used in the literature of the American Secular Union. Humanists use it too, as the pansy's current appearance was developed from the Heartsease by two centuries of intentional crossbreeding of wild plant hybrids. The Freedom From Religion Foundation (FFRF) uses the pansy symbol extensively in its lapel pins and literature. 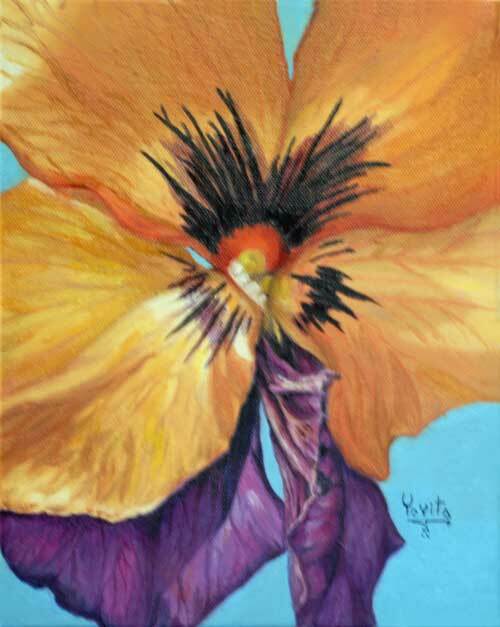 The pansy remains a favorite image in the arts, culture, and crafts, from needlepoint to ceramics. It is also the flower of Osaka, Japan.